← What Will Be the Results of This Innovation? Posted on August 16, 2015, in liturgy and tagged covering face, extraordinary form, humeral veil, latin mass, offertory, paten, subdeacon. Bookmark the permalink. 8 Comments. Thank you for your comment Prof. Kwasniewski. I was not familiar with this potential origin of the ritual. I found this subject a bit difficult to research as there were surprisingly few articles about this liturgical practice. With the Missa Solemnis being offered with greater frequency these days,hopefully some will find this post and your comment to be of some help. As far as I can understand only those ordained to the role of subdeacon in traditional communities or priests and deacons (diocesan or other) may officially serve as subdeacons. However, a letter by the Ecclesia Dei commission says those who have received the tonsure or clerical attire may serve as “straw” subdeacons. First, the tonsure is only still done in traditional communities (fssp, icksp, etc) which would seem to rule out diocesan seminarians, however, the “or clerical attire” caveat is reference to diocesan seminarians when they are permitted to wear the cassock with a Roman collar. Most diocesan seminaries allow their seminarians to wear a cassock with collar from either the very beginning of seminary or after a short period. I have heard various debates regarding the status of seminarian acolytes and instituted non-seminarian acolytes as well. Again from the various traditional liturgists (who are always willing to give an opinion) and documents that I have researched, being an acolyte does not seem to equate to being a full subdeacon as opposed to a “straw” subdeacon. 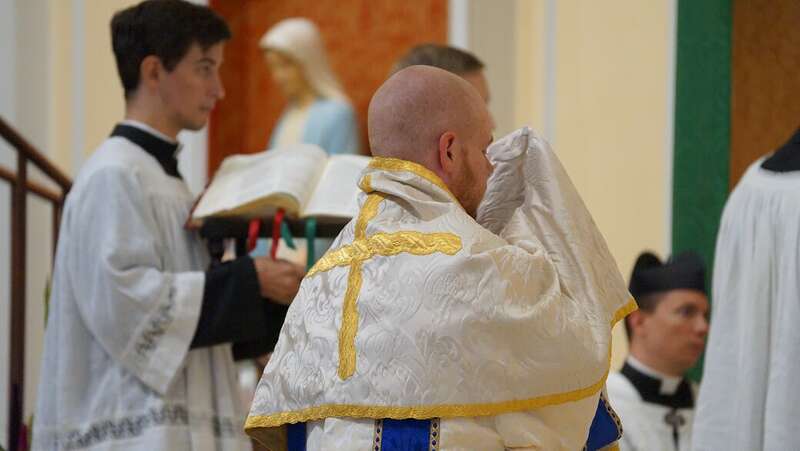 The main differences between a subdeacon and “straw” subdeacon are that a straw subdeacon would not wear a maniple or pour the water and wine at the offertory (there may be a few more little things I am forgetting, but those are the main ones I can remember from when I subdeaconed as a seminarian). Finally, there are even some who think that any Catholic layman can fill the role of “straw” subdeacon. I personally can’t find any evidence saying this is permitted, but am not confident enough to say authoritatively that it’s never allowed. Now allow me to give a final disclaimer, all of the things I have stated are the result of my own very fallible research, but perhaps it will be found helpful. Policies may even differ from diocese to diocese (does anyone have more info on this? ).